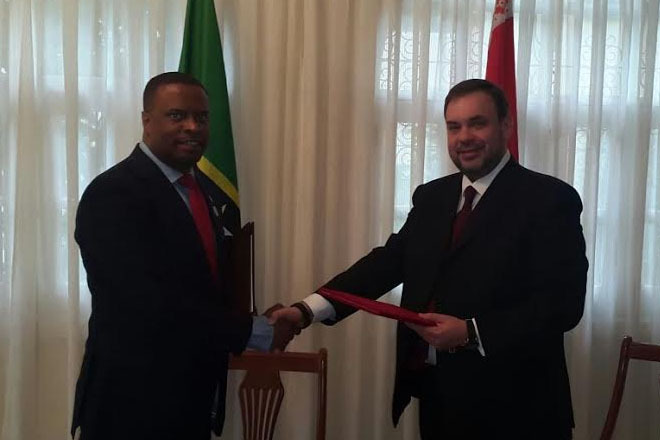 (Ministry of Foreign Affairs) — St. Kitts and Nevis on Saturday 4th June, 2016, formalized diplomatic relations with the Republic of Belarus, signaling the official completion of a process that began in 2004. At a brief ceremony held in Havana, Cuba, at the Embassy of the Republic of Belarus, St. Kitts and Nevis’ Foreign Minister, the Honourable Mark Brantley and Deputy Minister of Foreign Affairs of the Republic of Belarus, Mr. Evgeny Shestakov, signed a Joint Communique, establishing diplomatic ties between both countries. Both Foreign Ministers confidently expressed their satisfaction at the establishment of diplomatic relations that will contribute to the mutual development of trade, social, economic, cultural and other ties. Deputy Foreign Minister Shestakov thanked Minister Brantley for facilitating the establishment of diplomatic ties at this time, noting that the Government of Belarus has long had an interest in strengthening its ties with St. Kitts and Nevis.